The Amsterdam coffeeshops are unique. The coffeeshops – where buying coffee is just an extra option – were the first places in the world where buying cannabis was tolerated. Despite this tolerance, Amsterdam coffeeshops must comply with many rules and regulations. As a visitor, you can help coffeeshops stick to these rules, and stay clear of the police yourself. To help you along, we have listed the most important things you should know before you enter our fabulous Amsterdam coffeeshops. Unfortunately, that’s a question we can’t answer for you, as Dutch law still doesn’t allow this. Coffeeshops have to be very creative with their solutions. As you will understand, cannabis is not a product you can just buy in bulk quantities at some wholesale store. Believe us when we tell you that under these conditions, it’s hard work to serve your customers only the very best cannabis strains possible. If you’re looking for cannabis, hashish, or cannabis-infused edibles, you need to go to a “coffeeshop” – not a “coffee shop”. Amsterdam coffeeshops do serve coffee, but only as an added service! Ignore street dealers, and don’t take any non-cannabis ‘hard’ drugs with you when you visit a coffeeshop. Bring your ID, as proving your age is required. The legal minimum age for cannabis consumption is 18 years. Entering a coffeeshop under the age of 18 is not allowed, but some places require you to be at least 21 in order to enter. Coffeeshops are allowed to sell a maximum of 5 grams per person per day. A coffeeshop can stock a maximum of 500 grams of THC products, included space cake and cannabis-infused edibles. Alcohol and cigarettes are not allowed in coffeeshops – coffeeshops can lose their license if products are found during inspections by City Intervention Teams. Most coffeeshops have free rolling papers and filters. Don’t litter: never throw any kind of garbage (tips, filters, bags, cups) on the streets; help keep the city clean. Try not to be too conspicuous when smoking cannabis outside in public spaces. Don’t harass Amsterdam citizens or other visitors while enjoying your smoke. Be responsible: never smoke on playgrounds, near schoolyards, or in any place where minors are nearby. You’ll notice coffeeshop websites don’t list their cannabis collection. This is because it’s not allowed to advertise for marijuana. Make sure to bring cash with you, because very few coffeeshops accept card payments. Most shops only accept cash, although some allow PIN bank cards. Credit cards and debit cards are not accepted. Put simply, this means: no Visa, AMEX, Mastercard, American Express, and so on. Most coffeeshops won’t allow you to just hang out without buying something. Typically, you’ll need to buy at least one gram of weed or hash (edibles won’t cut it). Luckily, Amsterdam has plenty of smoke-friendly lounges, where you can smoke the products you bought elsewhere. (Check out CoffeeshopAmsterdam Café, for instance, where you can enjoy drinks and snacks as you happily puff away). No outside food or drinks are allowed inside coffeeshops. Don’t worry, however: you’ll usually find al the drinks and snacks you could wish for inside! When you buy your weed, always make sure to ask where you’re allowed to smoke or vape inside, if allowed at all. Coffeeshops are obliged to protect their staff from smoke by law. That is why sometimes, the whole shop is turned into a smoking lounge, while others have designated enclosed smoking areas. Still others, like our West shops, are take-away shops. Here, you’re only allowed to purchase, not to smoke, but of course, you’re more than welcome for a coffee or tea while you take your time to roll that perfect Amsterdam joint! If you’re planning to visit Amsterdam, make sure to stop by at the Coffeeshop Information Centre. This is an amazing Cannabis brand-store by Amsterdam Genetics, located right next to Amsterdam Central Station. 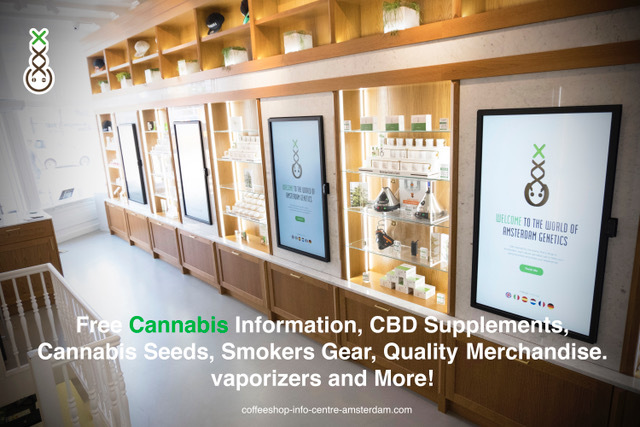 Their interactive touchscreens and the helpful English-speaking staff will tell you everything you need to know about the Amsterdam coffeeshops and responsible smoking in our unmatched cannabis culture. Start off your Amsterdam tour at the Coffeeshop Info Centre get smart before you get high! See you soon in lovely Amsterdam!